John Carter is based on the book ‘A Princess of Mars’ by Edgar Rice Burroughs. After seeing the trailer I was eager see the movie. My feeling after the movie was one of disappointment. The film tells the story of a man, John Carter, who gets transplanted to Mars and there becomes a prisoner of local inhabitants, creatures called Tharks. At the same time a war is ongoing on Mars between the cities of Helium and Zodanga. Zondanga, helped by a special force, is on the winning hand and Helium turns to John Cater to end the war and by doing so not only saving Helium, but the entire planet Mars. In the first quarter of the movie a lot of fantasy elements are brought into the story with initially no connection. I couldn’t empathize with the movie, I just didn’t believe it. I don’t know to what extent the filmmakers followed the book, but I think they tried to follow a Disney style. 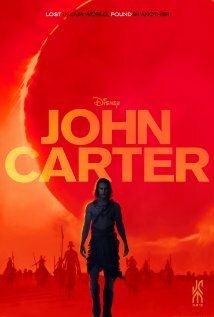 Director Andrew Staton already made two animated Disney movies (Finding Nemo and Wall-E) and now tried put some kind of Disney spirit in John Carter, a bad idea in my opinion. Although Disney brought legends in magnificent manner to life in the past, in this movie they try to create too much a fairy tale in my eyes. Because the story didn’t catch me from the beginning, it was difficult to get into the story during the rest of the movie. The second part of the movie was pretty boring. Although everything became clearer and all the elements were brought together to a whole, not much was happening at this point in the movie and I was losing concentration. The movie did get my focus by the end. The film ends with a nice big action scene with the necessary special effects which it made it very entertaining to watch. But as a whole, the movie did not deliver and failed to meet my expectations. With regard to the characters, the filmmakers didn’t do much with them. John Carter changes during the movie but they keep it simple, and the other characters do not evolve at all. Because of this poor elaboration of the characters, there was no chemistry between them, and although the acting performances are nothing out of the ordinary, I don’t blame the actors for this lack of chemistry. The film roles in this movie just aren’t difficult. The actors performed in a decent way, but the movie didn’t give the actors the opportunity for a mind-blowing performance. Not much is to be said about that. So the movie was a disappointment for me, but if you put your expectations not too high, it might be entertaining to watch.